Bred for the unforgiving and unpredictable waters of the world's most treacherous oceans, the all new Buddy Davis 58 Sportfisherman stands out in a market full of cookie cutter sportfishing boats, better suited for dockside entertaining than for serious fishing or cruising. Smooth. Dry. Sure-footed. Agile. Beautiful and, above all, safe. Add to this impressive list of credentials one of the strongest resale values in the industry, and the Buddy Davis 58 towers above the competition. Put the throttles to the pins. Throaty diesels roar as the 58 pops out of the hole onto plane, reaching a top speed of nearly 40- knots. The 58's proven hull and bulletproof construction ensure she can maintain these speeds even when the waters turn foul and all the lessser boats run for shelter. In collaboration with Buddy Davis Yachts, noted naval architect Donald L. Blount designed a hull with a deep entry forward, convex surfaces aft, tapering back to a 15 degree deadrise aft. Her entry is soft and easy. Pounding, even in large seas is non-existent. And of course her dry ride is legendary. Davis' investment in new tooling and advanced technology allows Davis Yachts to build far lighter boats than similar-sized convertibles, providing economical operation and the ability to run the engines under less load. It's no wonder Davis is the choice among serious anglers and cruisers from the waters of Puerto Rico, Tahiti, Bermuda and Mexico, to the shores of North Carolina. 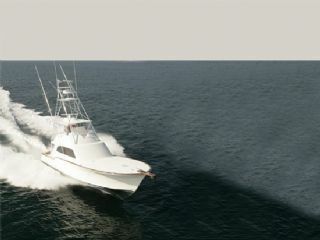 Her angling heritage is also evident in the large cockpit, offering room for the mate and anglers to fight big, aggressive trophy-size fish. Standard features include an oversized insulated baitwell with seawater circulation, a huge underdeck fish box and a transom fish box, a top-loading freezer with removable bait tray, tackle storage, and fresh and salt water washdowns. all-fiberglass production boats. The team of craftsmen know what a proper sportfishing yacht should look like, and the Buddy Davis 58 sets a new standard of aesthetic excellence.